InfoMaster ERP Financials is designed for financial managers to macro manage financial data and in the process, strengthen the financial mechanics throughout the business enterprise. This is accomplished through the effective use of online analytics reporting, query engines and pre-defined report typesets. 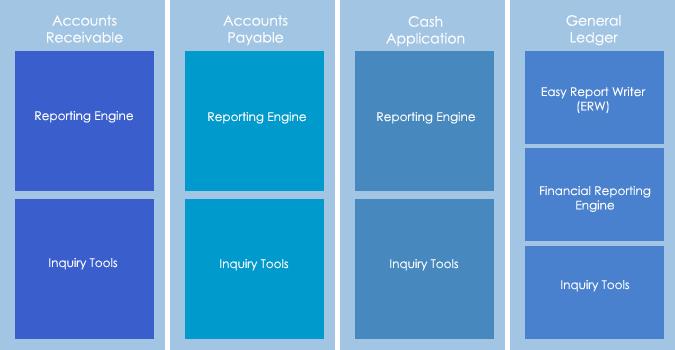 Finger-tip reporting mechanism allows financial managers direct access to pull financial reporting information immediately or with the shortest number of mouse clicks and key strokes. Proven financial management, coupled with familiar and simple to use data entry layouts, enables the people in your organization to focus on the tasks at hand and create a results oriented environment. • With fingertip financial management, financial managers will have instant access to information using the tools provided in the InfoMaster ERP Financials to reach their desired targets and measure organization financial performance. With a task based approach to financial management, we take care of the people performing the task. In this way, more tasks can be performed within a shorter time frame, without involving more resources than necessary. • The centralized Management Inquiry Dashboard (MID) provides the financial management with a snapshot of the business on a single screen. This overall view presents the company performance that can be analyzed and view from various angles. Thus allowing the management to understand the organizations performance in the past, know where they stand at present and forecast future performance. Drill down feature provides insight to the current figures and this contributes to an understanding of the data flow. With the MID, financial managers can be alerted to long overdue payments, high receivables credit note creation rate, negative cash flow position, bank deficits and many other financial sensitive alerts. • Tasks driven functions allows the users to accomplish more at a shorter time frame. InfoMaster ERP Financials is designed so that all common tasks associated with a particular function can be done a single data entry point. This would include transactions such as contra payments/ receipts, inter-bank fund transfers, bank charges entry, bank reconciliation, multi-currency payments/ receipts, etc. Common tasks are streamlined for quick and efficient data entry, hence reducing redundancy in keystrokes and double entries. • Convenient data analysis allows information to be exported to familiar spreadsheet and word processing applications. Top management requires some financial figures? No worries! The InfoMaster ERP Financials allows data to be exported to commonly used spreadsheet and word processing software. Data can be reorganized and formatting can be saved with the Financials Query Builder, for future retrieval locally or over the internet. This allows the management team to collaborate effectively either online or offline. With 25 years of successful ERP implementations for the finance and accounting industries, we believe that our expertise will be a valuable tool in helping your company to achieve your goals for computerization and resource optimization. If you have any questions about our ERP software for the Finance and accounting industries, please call us at +65 67475665 or click on one of the following tiles for more information on the relevant modules and benefits.